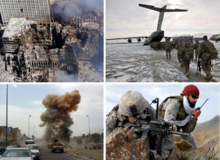 The Global War on Terror (also known as the War on Terror or the War on Terrorism) is an ongoing international military campaign led by the United States of America and the United Kingdom with the support of other NATO and non-NATO countries. The campaign was launched in 2001 with the US/UK invasion of Afghanistan in response to the September 11 terrorist attacks. Al-Qaeda is the name informally given to a network of Islamist terrorists operating through the 1990s until the present. This page was last edited on 2 May 2011, at 23:26.